Rodingtons existence in Saxon Times is evident from a reference to it in the Doomsday Book compiled by William the Conqueror in about 1086. In the Doomsday Book entries are arranged under counties. Shropshire “Sciropescire” was held by eight tenants in chief one of whom was “Roger the Earl” (Montgomery). His chief sub-tenant was Sheriff Raynaldus, whose land was scattered in several “Hundreds”; Rodington was in the “Hundred” of Wrockwardine. “There are a church and a priest and two villeins and three bordars, and three radmans. Among them all they have two ploughteams and work for three more. There is a ‘mill of sixpence’ “ (Annual value to the Lord of the Manor) In the time of King Edward it was worth 27 shillings, the annual value of the whole manor. At the time of the Norman Conquest, like most of this country, Rodington was probably little more than a collection of dwellings near the church and the ford across the river Roden, which is believed to take its name from the Welsh word “Rhe” meaning “running”. Round the dwellings would be an open area of land cultivated by the village on a communal system. The southern part of the parish where Roden and the Tern meet was probably a marsh, and the western part woodland. As the village grew in numbers so would the cultivated land have grown, though it is doubtful if the tilled (arable) land ever extended to the west of the Malthouse (The Poplars) and probably not as far west. But, owing to the need for firewood and timber, the woodland must have receded and the western tip of the Parish would have become common grazing land. The Parish extended westwards to Haughmond Hill, southwards to Walcot Mill and eastwards to Longwaste. In Norman times Rodington, Rodenhurst (Roden) and Sugden were held together. 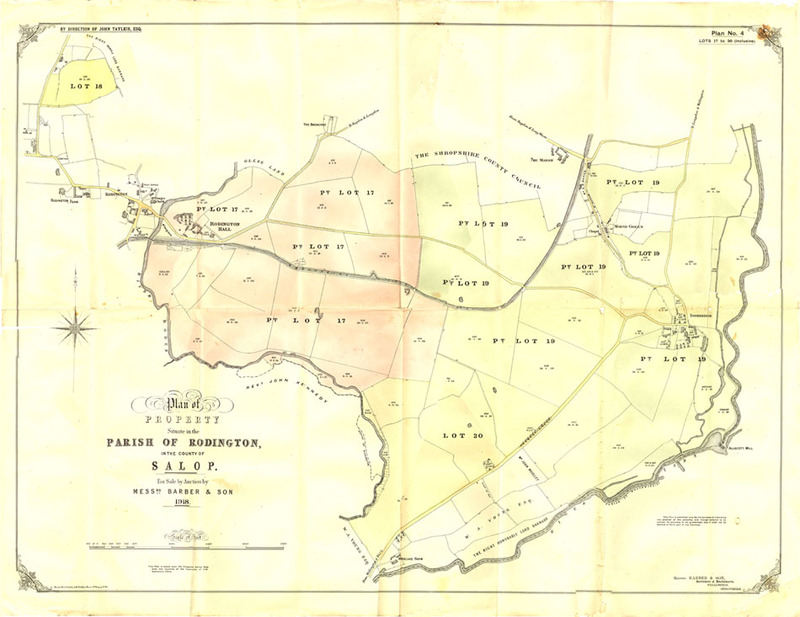 In about 1300 when the Parish became a separate Parish from High Ercall Sugden, including Longwaste, although detached seems to have remained with Rodington, while Rodenhurst (Roden) remained with High Ercall. It seems that the tilled common fields near the village were enclosed just prior to 1685, according to the records of the Glebe, and no doubt the marshland to the south had partially dried, for soon after this we have records of the Tayleurs, a family first mentioned connected with Rodington in 1270, owning a fair sized estate and a larger one in the Market Drayton area. In 1803 the common pasture land was enclosed and divided in proportion to their land amongst Corbet of Sundorne, the Lord of the Manor, and those who had commoner’s rights. Kinersley of Leighton, Pemberton of Shrewsbury, the Rector of Rodington, Brisbourne Brothers of Somerheath, Smith of Upton Magna and Humphreys. At the time of this enclosure in 1803 it is known that there had been some isolated fenced squatters holdings on the common pasture, probably the Malthouse (The Poplars), the Drury Lane cottages, Rose cottages and others. Thus at the time of the Tithe Award in 1842 the principal landowners were the Corbet estate at the west end of the Parish, the Tayleurs at the south end, the Duke of Cleveland (High Ercall estate) at the east end (Sugden), Brisbournes of Rodington House and the Rev. R.N. Pemberton, who owned Rodington Farm and larger estates at Millichope and elsewhere. Nevertheless there were quite a number of owner occuppiers round the village, sandwiched in between the three estates. The Tayleur Estate was sold, part in 1911 and the remainder in 1918; the High Ercall Estate was sold in 1930. Up to 1909 the Duke of Sutherland’s Lilleshall Estate extended as far as the east end of the Parish at Longwaste. The Mill, which is mentioned in the Doomsday Book and which presumably, as every locality had its mill, remained for long after, is not mentioned again, but may well have been what we now know as Ercall Mill, at the time of Doomsday in Rodenhurst (Roden), which was then held with Rodington. It could, however, have been Walcot Mill and the Tithe Award mentions Lee Mill, a few hundred yards upstream therefrom and Upper Mill Meadow, half way between Rodington Old Hall and the Island, which is perhaps more likely, being close by the village. The living was in Saxon times a chapel dependant on (High) Ercall and with High Ercall in the gift of the Abbott of Shrewsbury; although by 1300 it seems to have become a separate Parish. After the dissolution of the monasteries by Henry VIII until the year 1887 the appointment of a Rector to Rodington was in Royal hands. At this date, however, a deal between the Crown and the Church Commissioners was made whereby the advowson of Rodington and several other Parishes in Shropshire was transferred to the Bishop of Lichfield, in return to the transfer to the Crown of the advowson of several Parishes near Winchester. Until 1818 the annual visitation to which the churchwardens were, and still are, required to attend was held by the Bishop in person, but from this date was held by the Archdeacon. The Church Registers printed by the Parish Register Society began in 1678, but entries concerning Rodington prior to this date are found in the Register of High Ercall Parish, which dates from 1585.